With Dodge performance suspensions continuing to push the envelope in terms of capability and ride quality, more and more heavy duty truck owners are beginning to take their trucks off the beaten path. As these trucks are used and abused, weak points continue to present themselves in the form of axle housings that bend easily and need to be trussed or ball joints that need to be replaced with bulletproof units. One aspect of these suspension systems that has been addressed is the bump stops. There are a variety of solutions on the market for hydro bumps - both bolt on and others that require custom fabrication. Unfortunately, these options can be cost prohibitive and tend add a "jarring" effect to the last few inches of suspension travel. The solution? A replacement bump stop that engages during the last few inches of travel, "ramps up" as it nears full compression, doesn't rebound back, and survives up to 40,000 pounds of force without splitting or cracking. Traditional rubber compound bump stops weren't going to cut it. Many foam materials tested managed to absorb impacts but at the expense of cracking. Locating the correct material and design for trucks that weigh 7000 pounds or more proved difficult. After a year of sampling materials, engineering bracket designs, and testing various compounds, "Boogie Rated" bump stops are nearly ready. Boogie Bumps are the result of a collaboration between various Dodge off road enthusiasts and manufacturers within the industry. -Made from microcellular urethane. This material is progressive in that the more it is compressed, the more bottom out resistance it provides. Using presses and lots of real-world testing, there were no failures with this material in testing. -Taking measurements and testing with nearly every production shock/spring combination available, these bump stops are design to be completely bottomed out with 1/2" of shock shaft remaining, effectively increasing shock bearing lifespan. -There will be multiple options in regards to mounting. Those that ran similar bump stops on their trucks can mount these to the same location. Those that have not run similar bump stops will have the option to choose between brackets that modify the factory bump stop mount or brackets that clamp on to the factory mount. -These bump stops are 4.5" long, 2.5" wide, and 2.5" tall. They are black in color. 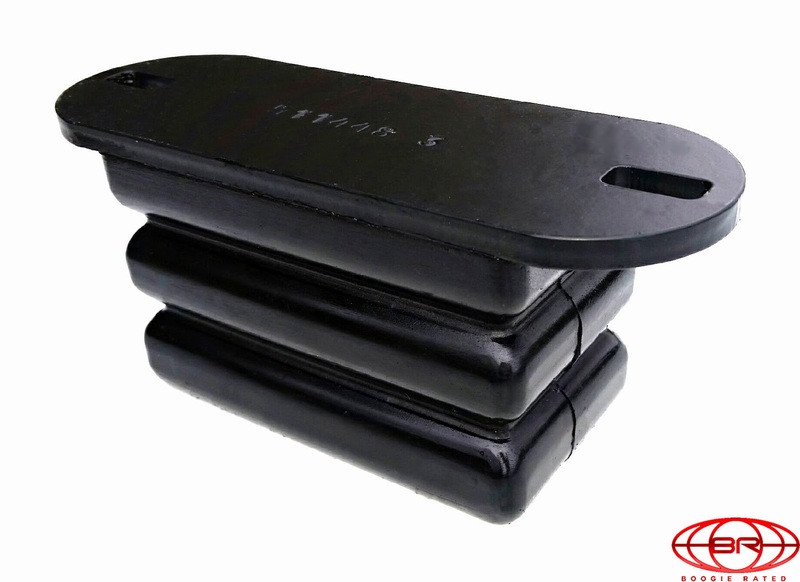 -Each set of Boogie Bumps will include a 180 day replacement warranty. -This material has been used in industrial applications for over 20 years. All goals were achieved in terms of handling characteristics. These bump stops offer a softer initial impact than hydro bumps while ramping up higher near full compression. When initially felt in moderate hits, these bump stops don't engage as harshly as hydro bumps. Under more severe hits, these bump stops become harder than hydro bumps. These bump stops to not "push back" like hydro bumps, standard polyurethane bump stops, or factory bump stops. When engineering bump stops for heavy duty trucks, durability was a priority. It was important to utilize a material that reacted properly when the truck is bottomed out without tearing apart. 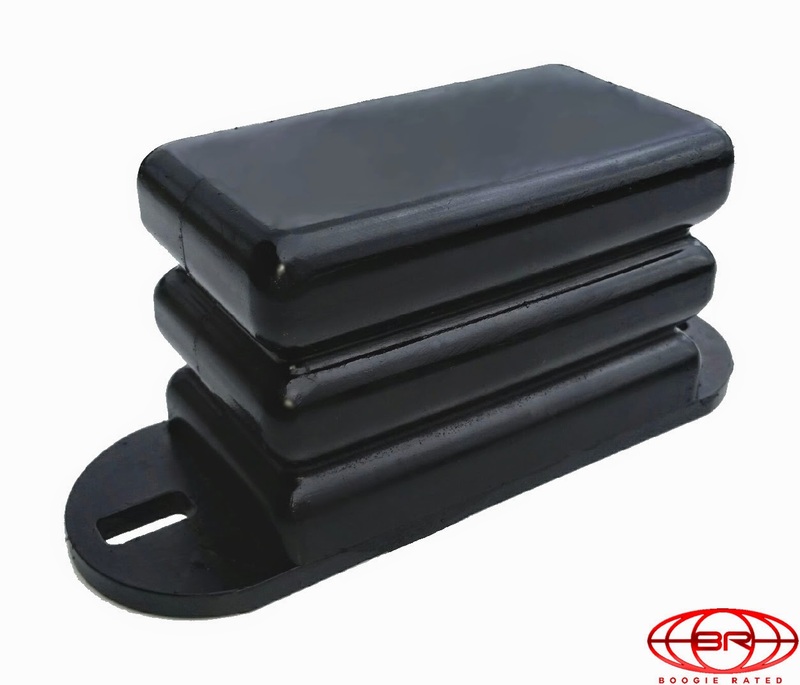 These bump stops were tested at up to 10 tons of pressure without fragmenting or splitting. Boogie Bumps will be available beginning later this month and will be up for preorder soon. The pictures shown are of the first production samples of the finalized design. More information will be available soon at boogierated.com.